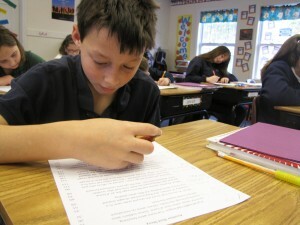 Charter Day School fifth grader Matthew Cason prepares for the End of Grade tests in his classroom. Charter school in Leland, NC takes measure of progress seriously but questions state’s formula. Think about a football team that scrimmages all year but ends the season never playing a game. Imagine an orchestra that practices for nine months but ends their year never holding a concert. Think of an artist who paints all year in her studio but never exhibits her work in a gallery. In education, the “End-of-Grade” tests, or EOG’s as they are called, are like the “big game,” the final concert or the gallery exhibition for which the students and staff have worked all year. At The Roger Bacon Academy – Charter Day School, the EOG’s furnish the opportunity for the students and staff to “show their stuff’ and let the world know what they can do. “I don’t think Dale Earnhardt, Jr. and his crew work all year building a car that they are just going to put up on blocks and never race,” said Bob Wingett, second grade teacher at the school. The school’s Headmaster Jennifer Beamer said they are competing with themselves and comparing this year’s scores with last year’s scores, not with other schools. “Each school out there has its own unique objectives with different goals, so it may not be fair to compare one school that emphasizes science with another school that has an emphasis on the arts or on history,” Mrs. Beamer said. “We see it as a great challenge to improve our scores from year to year,” she added. The school’s founder Baker Mitchell reflected on comments made that such tests may put pressure on the teachers. “Why shouldn’t teachers feel some pressure to improve?” he asks. “If a doctor is operating on me or a lawyer is defending me in court, I hope they feel a little pressure to do their best for me,” Mitchell said. “I think every good, conscientious professional will admit to feeling pressure to do their best on behalf of their clients and teachers should be no exception,” he added. As for the school’s scores this year, Superintendent Cramer said while only preliminary results are in, it appears that the students and staff have indeed beat last year’s scores. “I’m encouraged by our overall progress in raising our scores in most categories despite the 2.5% cut in state funding,” said Cramer. Cramer and Middle School Director Tom Miller both cited the fact that Charter Day School added a section of ninth grade high school English I to their eighth grade offerings this year and that 100% of the students passed the high school EOC test for English I. They also added high school Algebra I to the eighth grade curriculum several years ago and over 95% of the 40 students who took the course passed. Founder Mitchell points also to the large population of Exceptional Children that is being served by the school. “Over 11% of our students have Individual Education Programs and quite a few more have accommodations known as 504s,” said Mitchell. “We try just as hard for year-to-year gains for these students as for every other student on campus,” he added. Similarly, Mitchell said that a very high-performing student could fail to make “growth” if they slipped from an “A+” to merely an “A.” If a high-performing student wants to branch out and devote some energy to a sport or an extra-curricular activity, I think they should be allowed to do that without fear of being labeled as not having made growth,” he said. Mitchell said that Charter Day School looks at students individually. He said they try to intervene to catch up low-performing students even though the formula might say that they made growth. Likewise they don’t worry that a high-performing student might calculate as not making formula growth so long as they maintain high grades and have other activities such as being on the archery team or in chorus. Superintendent Cramer noted that the success of the Algebra program has encouraged him to add high school geometry next year in spite of another anticipated 3% cut in state funds. “We’ll just sharpen our pencils some more and figure out how to get it done,” Cramer said.